The not-so-wide world of audio has no shortage of companies that spring up fully formed, offering statement-level products. I think most people tend to be a trifle leery of such startups -- by definition, they have no track record, and the thought of plunking down a bucketful of cash for a product from an unproven company is a touch disconcerting. Id much rather deal with a company thats built itself up from the bottom, first producing inexpensive products that perform well above their price points, then slowly extending their reach to include better designs that deserve their higher prices. Over the past few years Ive gained significant experience with a fairly wide range of products from Pro-Ject (the company is based in Vienna, Austria; their factory is in Litovel, Czech Republic), and all of those have excelled at their respective price points: from the Xperience (under $1000) to the RPM 9 ($1499) which I reviewed a year or so ago and subsequently purchased. When I heard from Kurt Martens, the companys Canadian distributor, that Pro-Ject was planning a new top-line turntable, I put my name down for a review sample in no uncertain terms. After some months of constant badgering, Martens delivered and set up the RPM 10 himself. And mighty nice it is, too. At first glance, the RPM 10 ($2499 USD) looks like an RPM 9.1 on steroids. (When the 9.1 became available, I promptly upgraded the RPM 9 that Id reviewed and bought.) RPMs 9, 9.1, and 10 all feature acrylic platters, carbon-fiber tonearms, and chunky, standalone AC motors that are finished to match their main plinths. The latter two have MDF bases that are lacquered in an absolutely delicious, understated gloss gray. Yet while the 9.1 and 10 share a common form, the RPM 10 is much more than just a beefed-up RPM 9.1. Instead of a linear evolution, the RPM 10 is more a geometric progression from the still-available 9.1. Other than its sheer scale, evident in the RPM 10s 2.25"-thick plinth and 2.3"-thick platter, the bigger table features a host of improvements both small and not so small. First off, the RPM 10 comes with a 10" tonearm whose headshell and tapered armtube are formed from a single continuous piece of carbon fiber. The arm features ABEC-7-spec bearings, and has adjustable vertical tracking angle (VTA), azimuth, and skating. Pro-Ject has addressed the one nit I picked with the RPM 9: the armrest is now a solid piece, into which the arm can be locked in place even with the cueing lever in the up position. Given the RPM 10 tonearms high level of quality and engineering, the only area for improvement, in my opinion, is the azimuth adjustment. Currently, the arm is press-fitted into the bearing housing, and once the azimuth is adjusted, only one small set screw holds the arm in place. While the arm does fit nice and tight, this solution is rather inelegant, and seems out of place in such a high-end turntable. However, this sort of approach is most likely the type of engineering that allows Pro-Ject to build such an outstanding turntable for so little money. Despite this small gripe, the RPM 10 tonearm is superbly built, and wouldnt be out of place in a much more expensive turntable. The RPM 10s additional bulk hides several important innovations, one of which is exceptionally cool. Hidden under platter and plinth are two honking big ring magnets oriented to repel each other. While the magnets arent strong enough to fully levitate the platter in the manner of the Star Trek-like Platine Verdier, its quite easy to feel them reducing the platters perceived weight as its lowered onto the bearing. This allows Pro-Ject to use a thicker, heavier platter than otherwise -- one that provides additional speed stability due to the flywheel effect, among other benefits -- while still keeping bearing noise down due to less weight and its associated friction. A further benefit of the dual-magnet system is that you get to tell your friends about it, which should substantially elevate your rank in the pecking order of gizmo-crazed audiophiles. Youve probably guessed by now that those two big magnets substantially add to the RPM 10s weight, and youre right. But theres much more to come in the mass department. Like the RPM 9.1, the 10 has a steel plate embedded in its MDF plinth. This plate adds to the tables mass and lowers its center of gravity, which should increase its overall stability. Further, the plinth is hollowed out and filled with what Pro-Ject calls "granulate," which I gather are metal filings of some sort. Theoretically, the filler should add weight and damping, and, combined with the MDF and metal plate, promises a solid, well-damped base for bearing and platter. Obviously locked in the throes of a damping frenzy, Pro-Ject didnt stop there. The RPM 10 is mounted on three aluminum cones, which are further separated from the bottom of the plinth by Sorbothane pads. Nor are we done yet. Pro-Ject supplies the RPM 10 with its Ground-It Deluxe base, finished to match table and motor and also made of "granulate"-filled MDF. The Ground-It Deluxe rests on a number of rubber buttons that keep it elevated by a couple of millimeters (alternatively, the Ground-It Deluxe can be used with the supplied machined-aluminum cones). The power supply is a punky-looking wall-wart. Kurt Martens expects that most purchasers will likely drop the extra bucks for Pro-Jects Speed Box SE power supply. If so, I wonder why they dont make it part of the package and raise the price accordingly. The RPM 10 is far too impressive a table to connect to the mains via such an insignificant-looking plug. But Pro-Ject has a tradition of using parts that are acceptable and functional without resorting to overkill for its own sake. I imagine the wall-wart works just fine -- and I used my own Speed Box SE for the duration of the review. The result of all this mass and these varying components is a total claimed assembled weight of 62 pounds. Thats serious bang for the RPM 10s 2499 bucks. As with the RPM 9.1 and RPM 9 before it, the RPM 10 is shipped in a neat, compact, well-thought-out box replete with a ton of accessories, including gloves, a spirit level, and one seriously chunky record weight. The only thing missing is some kind of alignment gauge. No serious vinylphile should be without an Align it, Pro-Jects ultracool alignment tool, but unfortunately its sold separately. Due to many comings and goings of review equipment in the past few months, my system has been in serious flux. As a result, the RPM 10 saw duty in a number of system configurations. Loudspeakers were Focus Audios Master 3, Monitor Audios GS60, and my own Hales Transcendence 5s. Amplification duties were handled by either my own Anthem Statement P2 or Ayres V-5xe (review in the works). I used several preamps: my own Sonic Frontiers SFL-2, Song Audios SA-1, and the Ayre K-5xe (review also forthcoming). Phono preamplification was handled exclusively by my own Ayre P-5xe. Cartridges alternated between my Roksan Shiraz and Shelter 501 Mk.II. For this review I used Analysis Plus Solo Crystal Oval interconnect to carry balanced signals, and Acoustic Zen Matrix for single-ended duties. AC cords included Shunyata Research Taipans and Cardas Hexlink 5, and, when I couldnt avoid it, a smattering of generic blacknuglies. Shunyatas Hydra Model-6 filtered and protected all gear. I used Pro-Jects own supplied phono link to join the RPM 10 to the Ayre phono stage. As I mentioned earlier, the RPM 10 replaced my own RPM 9.1. If you havent read my review of the RPM 9, please feel free to nip on over to SoundStage! and take a peek. (Ill wait.) The RPM 9.1 is no chump in the price/performance department -- at $1499, its an outstanding, exceptionally neutral performer -- but the RPM 10 proved itself an obvious cut above it in just about every parameter. Its seldom that performance and value jump up in such direct proportion to price. Ah, youre back. Good. In case you didnt read the whole thing, Ill summarize the overall RPM experience for you, as this line of turntables share a definite family sound. I clearly remember the first time I heard the RPM 9: I was distinctly taken with the neutrality and correctness with which it portrayed music. While it refrained from romanticizing or editorializing, the RPM 9, and the 9.1 after it, never strayed in the direction of thinness, nor did it lean toward a clinical sound. Likewise the RPM 10. On first listening to the 10, I was struck with the three tables consistency of tonal balance. The RPM 10 gave me the distinct impression that it was passing the signal along in a truthful, evenhanded manner. It was all there -- tight, well-defined, extended, eminently satisfying bass (its rare, in my experience, for any component to adequately combine all four of those characteristics), rising through a clear, uncolored, well-defined midrange, all the way up to an equally extended treble. But countering this, its overall lack of apparent coloration leads me to describe the RPM 10 as being defined by its lack of a sound. In case youre wondering, this is good. There are plenty of ways to change the sound of a system, but if your source starts out with any deviations from neutrality, theres no way to restore a sense of balance further down the component chain. Any of the Classic Records reissues featuring Johnny Hodges are instructive examples. Take Side by Side: Duke Ellington and Johnny Hodges [Verve/Classic MG VS-6109], for example. This recording is lush in the extreme, Hodges tenor sax doling out an overload of schmaltz that could prove toxic if played back on a system that adds euphonic sweetening of any kind. I know this recording very well, and the RPM 10 nailed it, refraining from emulsifying any of the juicy horns, which just drip with ambience. I dug this bonbon out of the record rack specifically so that I could mention it here, but after listening to it for the first time in about a year, I sat through the whole thing, then turned around and played it again. Yowsah! But neutrality has another side. For my own musical satisfaction, its vitally important that I keep any thinness or etch well away from my system. Truthfulness is fine, I say, but a reasonable amount of decorum must be exercised. The RPM 10 was honest but not rude. Playing that same Ellington-Hodges disc, there was plenty of shimmer to the ride cymbal, and the bell of Hodges tenor was clearly audible, with boatloads of harmonics lifting it way the heck off the record. The phrase sonic neutrality implies a tight grip on both the leading edges and tail ends of musical phrases. One of the side benefits of the RPM 10s superb tonal neutrality was the propulsive manner with which it presented music that was rhythmically complex. Staying with Classic Records, lets turn to their outstanding reissue of John Coltranes Blue Train [Blue Note/Classic 1577]. This albums title track is timeless jazz with deep drive. The rhythm section of Paul Chambers and Philly Joe Jones locks down a groove that carries the entire tune, and trombonist Curtis Fullers counterpoint rolls that tune along to his own agenda. In comparison with the RPM 9.1, the RPM 10 added an extra dollop of energy by way of a cleaner delineation of these disparate rhythmic grooves, and by adding in that beat-based detail, the whole intent of Blue Train is laid out in expansive detail. The upshot? Blue Train simply rocked through the RPM 10. I have repeatedly sat riveted, listening through both sides of the entire album. Blue Train -- the whole album as well as the title track -- provided a wealth of insight into the RPM 10s many talents. When played back at realistic volumes (i.e., loud), there was a ton of dynamic drum and bass work going on in the background that was missed at lower levels. The first two minutes of "Blue Train" contain a number of incidents, for want of a better word, wherein the entire rhythm section seems to drop the beat down at the same time. The RPM 10 introduced to my system a whole new world of dynamic prowess, sounding larger, bolder, and more in charge than the RPM 9.1. Via the RPM 10, I was clearly able to delineate the microdynamic shifts in musical events, which in turn brought me closer to the musical performances, warts and all. As Ive said, the RPM 10 improved on all of the things that the RPM 9 and 9.1 did so well, but I think its a good idea to reiterate some of those attributes. All three turntables are exceptionally quiet, with an outstanding sense of "blackness"; from that low noise floor images float with airborne grace, totally free of mechanical boundaries. The RPM 10 didnt present images with additional complications, relying on its tonal neutrality and precision to get its point across rather than adding overtones or overt rhythmic bounce. Ive always felt uncomfortable with the concept of a component being perfect for a reviewer, as this seems to imply that its going to be bone-dry, bright, and musically unsatisfying. Its almost as if reviewers must forgo any form of musical pleasure so that we can better discern useless and barely audible minutiae. Not this reviewer. That said, the RPM 10 is perfect for me, because it manages to be musically satisfying and truthfully revealing at the same time. With the most convenient (and very effective) Pro-Ject Speed Box, the flip to a 45rpm example of this mix of neutrality and musicality was only a button-press away. Ive fallen in love with Richard Thompsons "1952 Vincent Black Lightning," from Some Enchanted Evening [Mobile Fidelity MFSL 1-45006]. I go misty-eyed whenever I hear its storyline of boy-meets-girl, boy-dies, boy-gives-girl-motorcycle. This live recording is beautifully mastered and pressed, and is certainly up to the legendary high standards for which Mobile Fidelity is famous. The RPM 10 portrayed the interplay of the two acoustic guitars on this track with finesse and delicacy, each note from each string standing out in crisp relief despite the musicians intense busyness. Thompsons voice, with its rich, evocative tone, inhabited the stage dead-center, and the RPM 10 sorted it all out, perfectly riding that fine line between detail and richness. Isnt that what this audio business is all about? The audiophile press tends to make its readers feel that if they cant float $10k for a component, then they just cant experience good sound. This is doubly true for turntables. 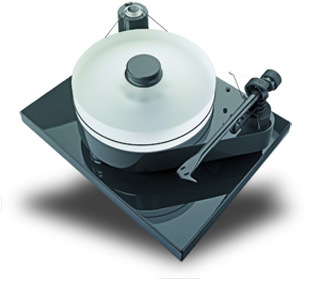 While many reviewers pay lip service to inexpensive turntables such as the Rega P3 or any one of the many Pro-Ject tables in the same price range, they then go gaga for the latest and greatest Rube Goldberg complications, which start at the price of a small car and go up from there, through and past the luxury-wheels range. Well, maybe theyre right and maybe theyre not. Im betting that theyre not, because this here Pro-Ject RPM 10 tells me, in no uncertain terms, that you need only $2499 to gain access to the real high-end world of vinyl reproduction. Now excuse me while I count my pennies to see if I can swing this upgrade.